I am deeply interested in Canada: the historical and current sociocultural climate of this land and my presence here as a settler-immigrant form the backbone of my practice. My research lies primarily in unpacking immigrant experience in context of the ongoing legacy of colonialism in the West. How do young first-generation migrants reconcile their hybridized identities while navigating the pressure towards assimilating with that of retaining cultural uniqueness? In working to create multifaceted and complex representations of diasporic identity, my work often intersects with questions of land, access and belonging. Site-responsive projects such as Finding words for the feeling (2016-ongoing), Another Country (2017), and The Journey West (2017) have allowed me to explore these interests using embodied, durational approaches to performance and video. Ultimately, I am engaged in an active process of place-making by learning to create, take up and share space for meaningful dialogue on life in diaspora. The Journey West, 2017. Video still. Abedar Kamgari is an artist, independent curator, and arts worker based in Hamilton and Toronto. Her research is rooted in investigating immigrant experience in context of the ongoing legacy of colonialism in the West. 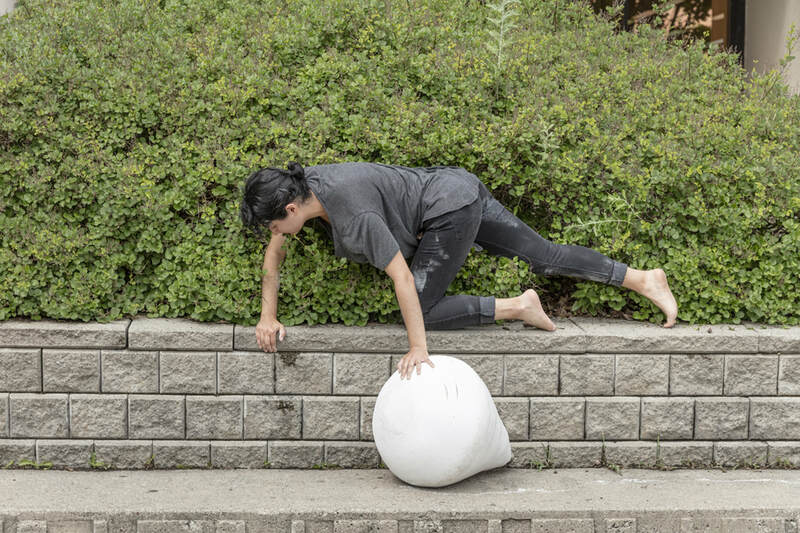 Abedar’s practice both as an artist and curator is centered on resisting hierarchical barriers within the arts by imagining intersectional alternatives. As an administrator, she has held positions with Factory Media Centre, McMaster University, Oakville Galleries, and currently works at Hamilton Artists Inc. Abedar received a BFA from McMaster University in 2016 and has performed and exhibited throughout Southern Ontario in artist-run centres, DIY spaces, and public galleries. Finding words for the feeling, 2017. Performance documentation. Image: Toni Hafkenscheid.